Nothing says Halloween like a bloody eyeball. This version uses Betty Crocker Fruit Roll-Ups Stackerz, but you could substitute Necco wafers or pretty much any disk-like colored candy. What You Need: 1 cupcake; white frosting; Stackerz or other round candy; red hots (cinnamon imperials); red gel icing in tube. How to Make It: Frost cupcake. 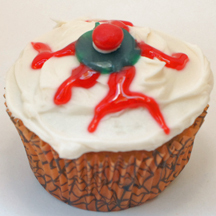 Use red gel icing to draw bloodshot squiggles outward from center of cupcake. Use dab of icing to adhere red hot to center of disk-shaped candy. Place in center of cupcake. These cupcakes may not look appetizing, but trust us, they taste great while also being good for a laugh at a Halloween party. What You Need: 1 cupcake (baked and cooled); white frosting, red writing icing or gel, green or blue gumdrop, red hot imperial candy. How to Make It: Frost cupcake using white icing. Using rolling pin, glass or just your hands, squish a gumdrop into a flat disk. 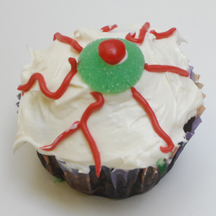 Use a dab of frosting to stick red hot candy to gumdrop for pupil of eye. Stick the eye in the center of the frosted cupcake. Use red writing icing or gel to draw on veins to make the “eyes” look bloodshot. So creepy your eyes will get watery just making them!